PokerStars announced earlier this week about a huge change that they will be conducting with their VIP program, and this has every poker player annoyed. The current VIP program being used is simple; you earn a certain amount of Frequent Player Points (FPPs) each month and based on the amount, you can rank higher. Players could go from Bronze Star up to Supernova Elite, enjoying many different rewards, bonuses, and promotions. 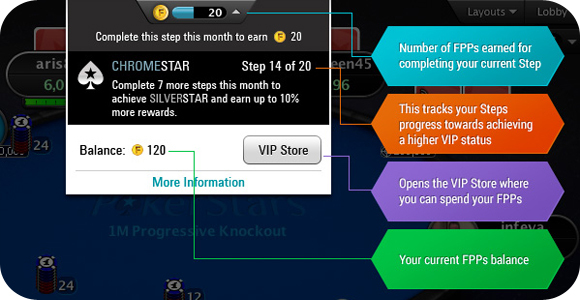 It’s the end of the month and a SilverStar player has earned 80 of the 100 VPPs required to complete their current Step, which offers a reward of 150 FPPs. The prorated value of their VPPs is 80/100 x 150 = 120 FPPs. They will earn 50% of the prorated value, or 120 x 0.5 = 60 FPPs. In other words, players won’t get exactly what they have paid for, but rather only 50% of their entire month of playing. The Beta test has already begun as of August 31 at their UK site, where players can join in to start getting used to the new system, as well as helping to find bugs and other problems early on. Players have been quite vocal about the absurd change in the VIP program. It seems more obvious that PokerStars is trying to make up for their decreasing player base by trying to get more revenue from the existing members, at least this is what most of the loyal poker players believe. This strategy may not work out for the company how they imagined it would, but we will have to wait and see how the market reacts when 2016 rolls around.